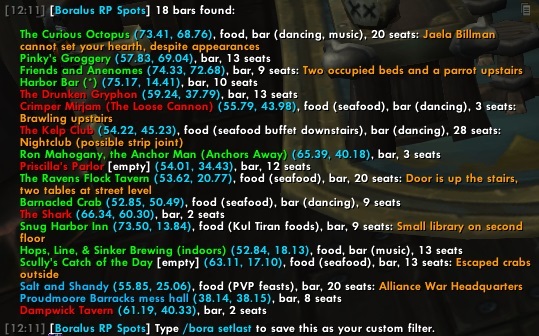 HandyNotes: Boralus RP Spots is a plug-in for the popular HandyNotes addon. 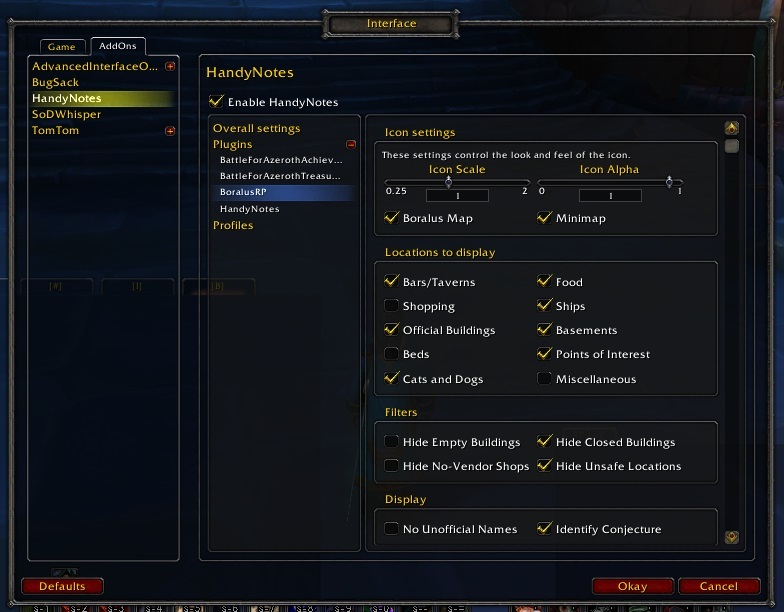 It extends the capabilities of HandyNotes by providing a pre-selected, comprehensive list of locations and NPCs in the city of Boralus, with an eye to the potential for roleplay. In addition, HN:BRPS supports a fully-integrated, searchable database of locations that you can access with the /bora command. 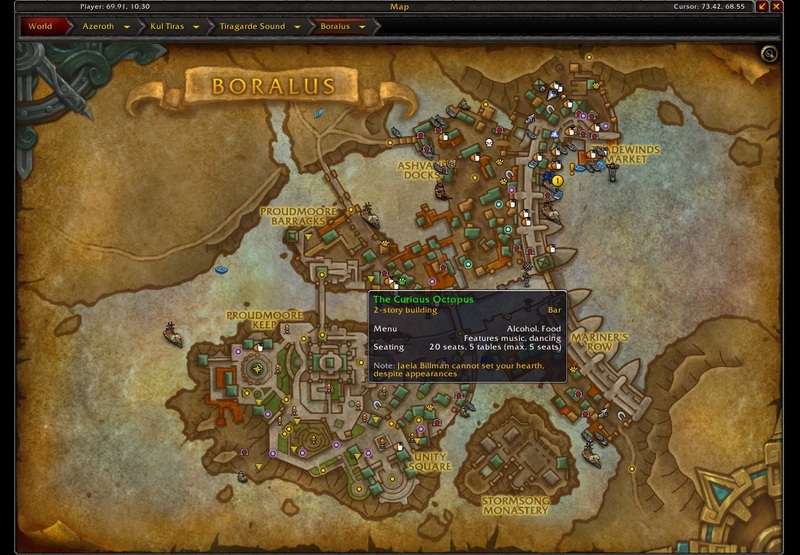 With HN:BRPS, you can specify the types of locations you wish to track, and those locations will appear on both your regional map and minimap when in Boralus. 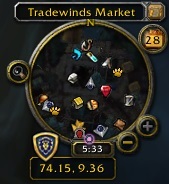 * Shops without Vendors -- there are some buildings that claim to sell wares but lack an actual vendor -- hide those! Empowered with these locations on your minimap or city map, you can meet up with other roleplayers, explore the hidden secrets of Boralus, or just find somewhere fun to hang out while waiting for a long DPS queue. /bora tables:2 seats:10 -- looking for a place for a guild meeting? /bora dancing alcohol -- A night on the town! You can also use the /bora command to set a custom filter that overrides your normal settings. Are you looking for the Ravens Flock tavern? Clear the rest of your map with /bora set raven, and then toggle between the filter and your usual map icons with /bora toggle. If you just did a search for something and want to use those results, use /bora setlast and you're good to go! HN:BRPS requires the HandyNotes addon to function; otherwise, it's of no use at all. In addition, if you use the TomTom addon, you can automatically set a waypoint by right-clicking on the HN:BRPS location icons. HN:BRPS uses data that was supplied in part by members of the Boralus-RP community.